Can y’all get down with all this funky green?! YES! Yes you can! I was eating these tacos at the office break-room table and an audience began gathering around – What is that?! What’s all that green stuff? You always eat so healthy! I’m always caught off guard when my lunch is described as being healthy. Honestly, I’m just eating this because it tastes good. Yeah, I can eat the hell out of some almond butter brownies but tender baby bok choy all caramelized with tamari and honey comes in at a close second. I remember the very first family dinner where my parents met Mark. We all knew my dad was going to say something embarrassing, it was just a question of when. Sure enough, in the middle of dinner he turns to Mark and says (in a somewhat braggy tone), “my daughters have really great tastebuds”. That’s not some weird german phrase that got lost in translation – I don’t exactly know what he meant by that but I’m thinking it must mean we like to eat good food. I’m choosing to take it as a compliment because I truly believe that flavor drives nutrition. I think the sweeter and juicier the strawberry, the better it is for you. We’re getting way too caught up with reading labels, counting calories and tracking points. What would happen if we listened to our bodies, gave into our cravings and just ate what tasted good to us? 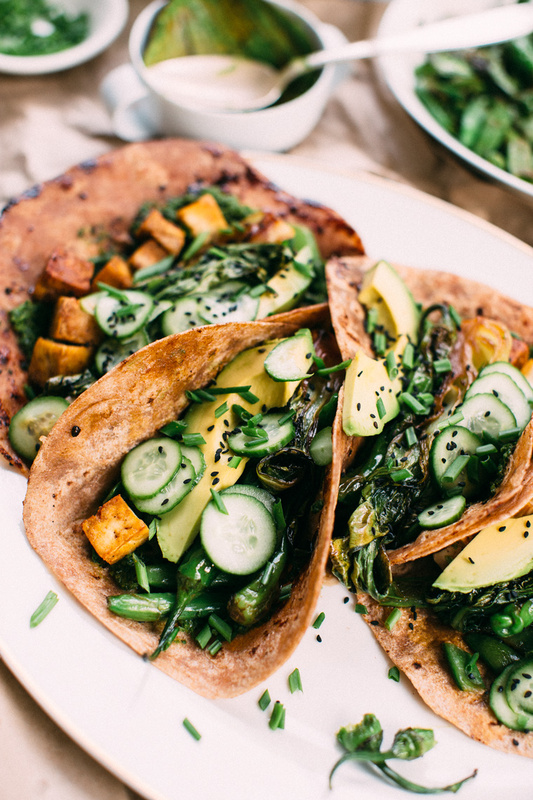 These tacos celebrate every little flavor receptor on your tongue – creamy avocado, savory tofu, sweet umami glazed veggies, bright crunchy pickles and smokey spicy sauce. A big YES to eating what tastes good! Roast peppers over an open flame on your stove top or under the broiler. When they are cool enough to touch, remove burnt skins, stems and seeds. Place all the ingredients into your food processor and blend until smooth. 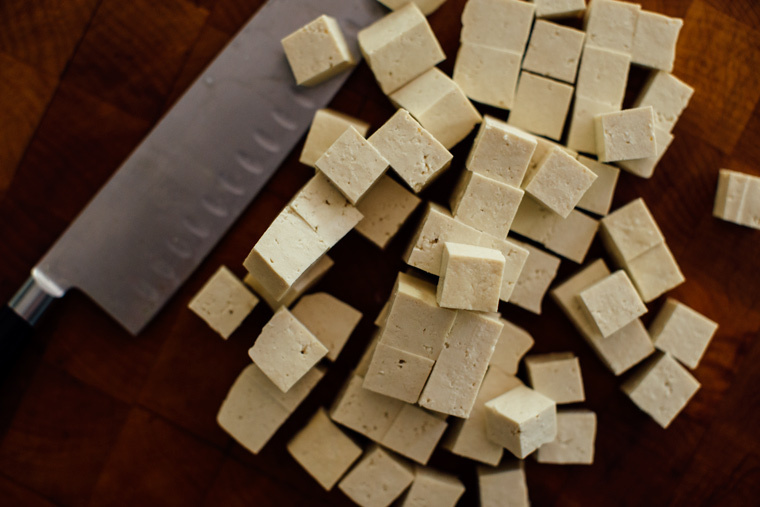 Dry the tofu well. Cube it into small even chunks. Heat oil in a pan. 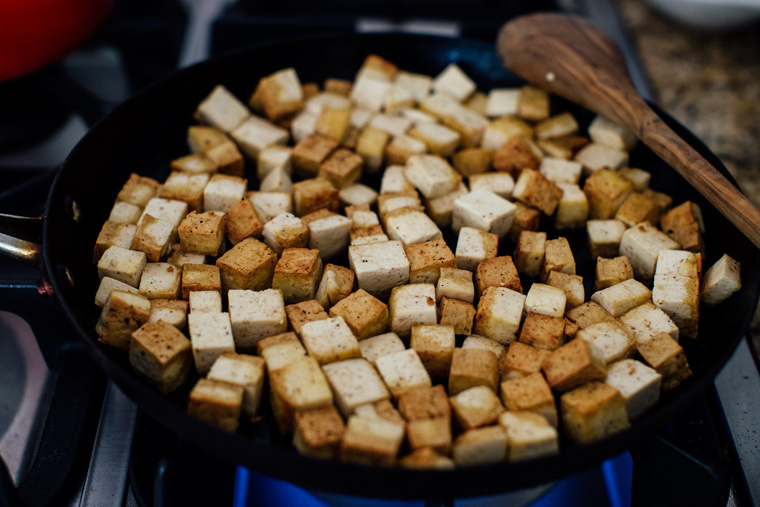 Fry tofu until light brown on medium / high heat. Add the tamari and liquid smoke and turn heat off. Stirling to coat. Fresh ground pepper to finish. Heat the butter and olive oil together in a pan on medium heat. 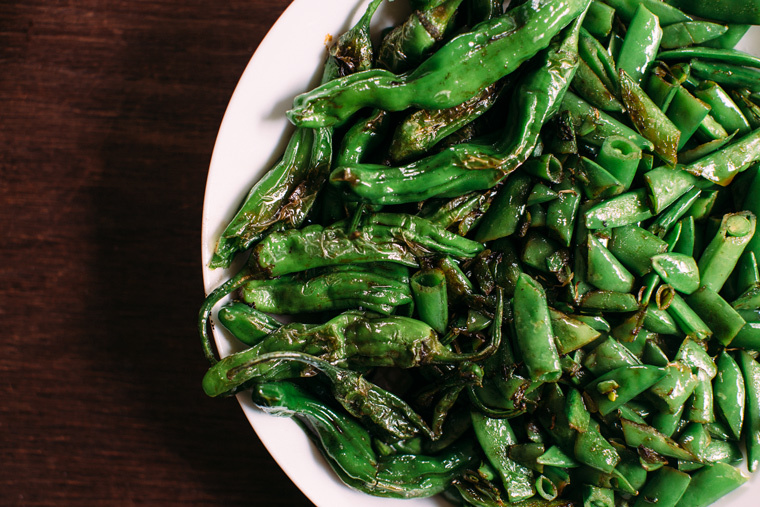 Toss the washed and dried veggies into the pan and sauté until bright green, 2 to 5 minutes. Add the tamari and sauté for another minute. 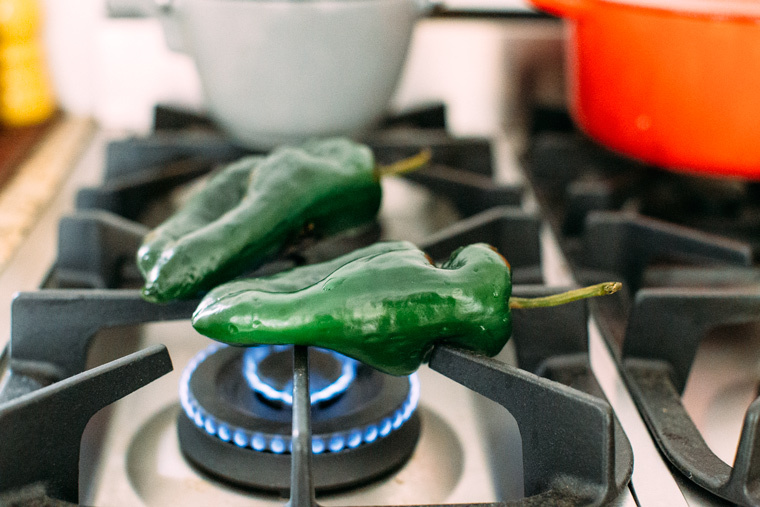 Roast peppers over an open flame on your stove top or under the broiler. When they are cool enough to touch, remove burnt skins, stems and seeds. 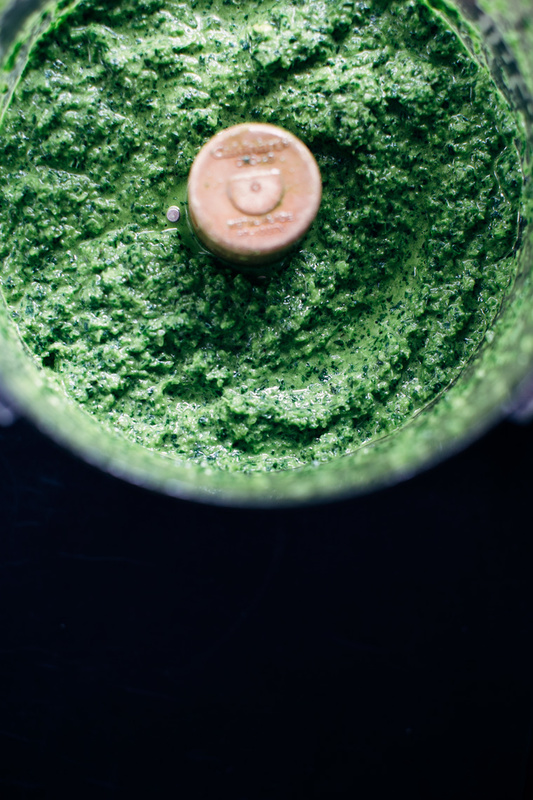 Place all the ingredients into your food processor and blend until smooth. Dry the tofu well. Cube it into small even chunks. Heat oil in a pan. 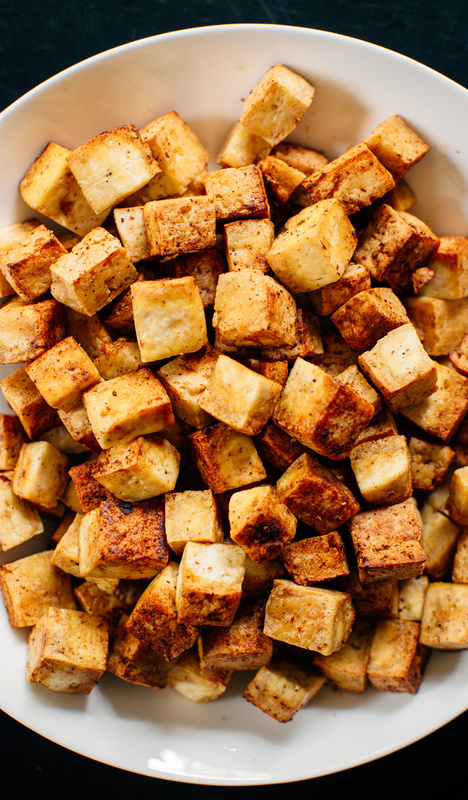 Fry tofu until light brown on medium / high heat. Add the tamari and liquid smoke and turn heat off. Stirling to coat. Fresh ground pepper to finish. 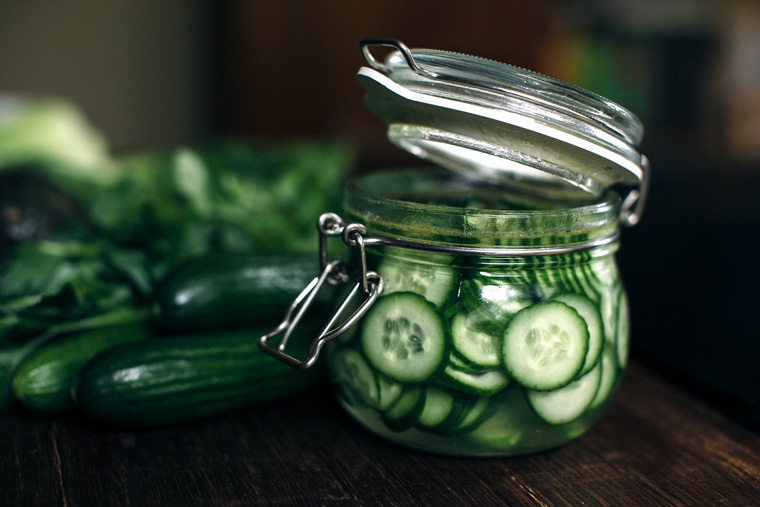 Slice cucumbers thinly and evenly, preferably on a mandolin. Bring water, vinegar, salt and honey to a boil. Let cool for a minute. Pour liquid over the sliced cucumbers. Add the sesame oil. Cover and chill. Heat the butter and olive oil together in a pan on medium heat. Toss the washed and dried veggies into the pan and sauté until bright green, 2 to 5 minutes or until a bit blistered. Add the tamari and sauté for another minute. Heat the butter and olive oil together in a pan on medium heat. 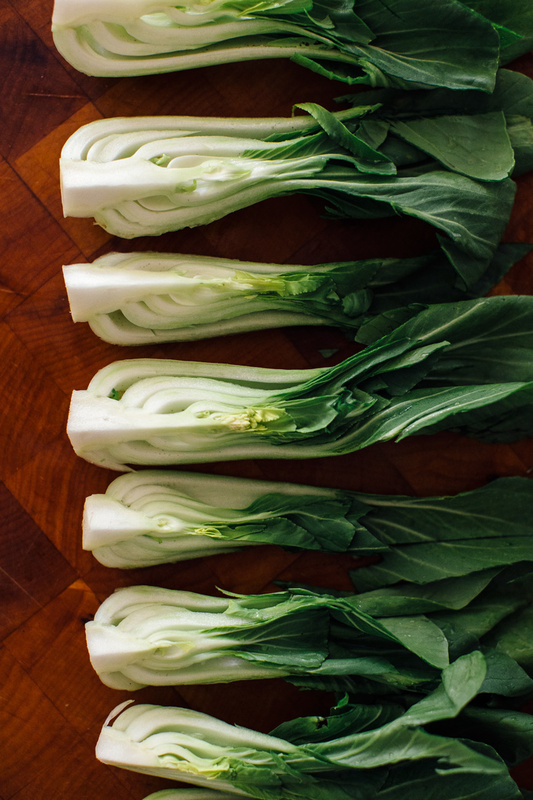 Toss the washed and dried bok choy into the pan and sauté until bright green, 3 to 5 minutes. Add the tamari and honey and sauté for another minute. 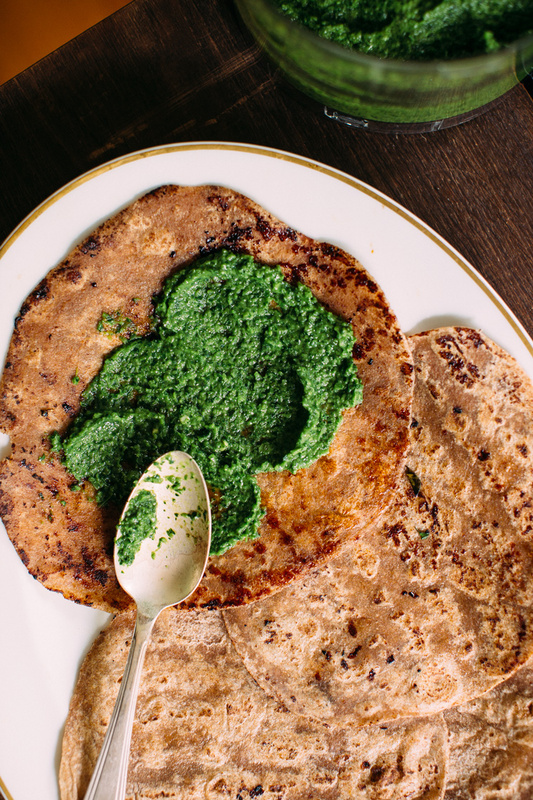 Avocado, chives, sesame seeds + your favorite tortillas. 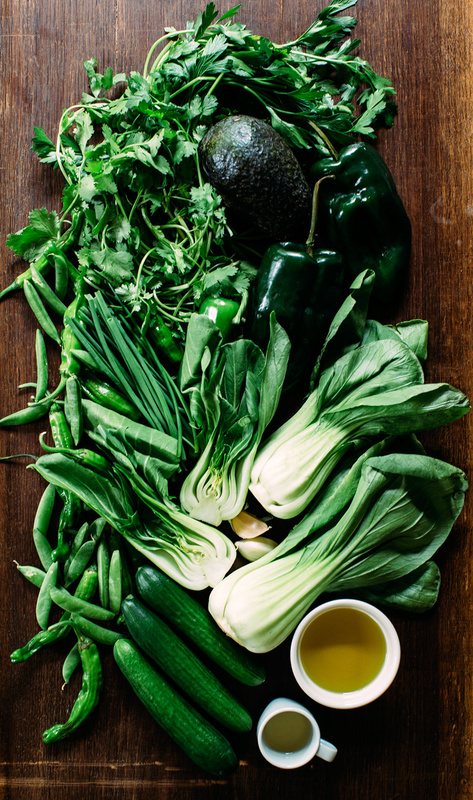 Melissa’s shared their baby bok choy with me – it’s the sweetest! Those quick pickles are so neat!! This sounds delightful! These look heavenly! Pinning them now! I totally LOVE the idea of eating what tastes good to us. That’s the best route to happy + healthy eating in my book. 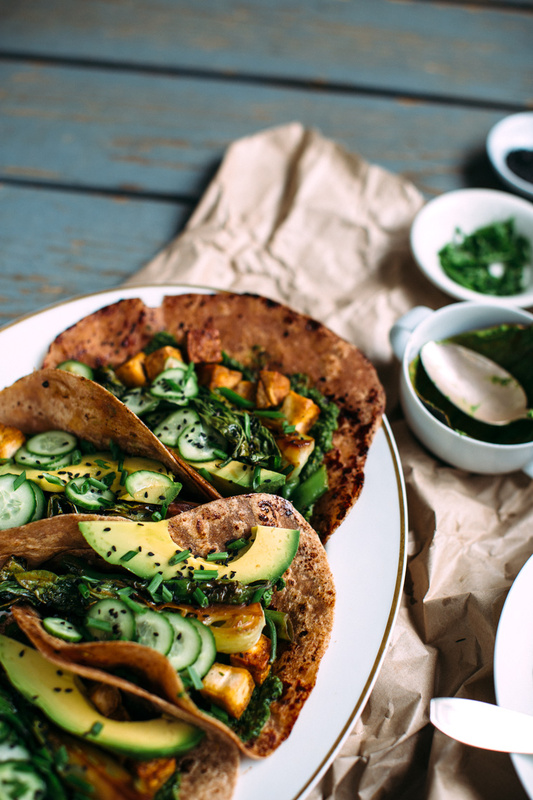 These tacos look insanely good. I want them all, right this minute. 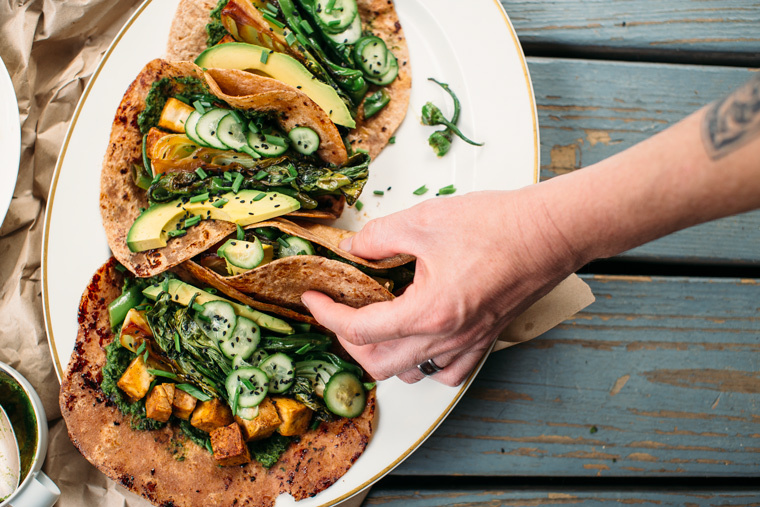 I cannot get over how gorgeous these tacos look. 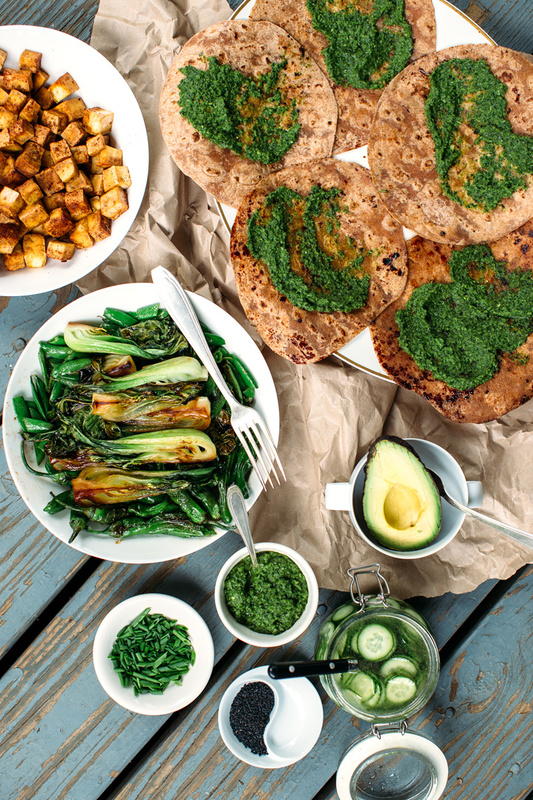 You seriously blow me away with your creative, delicious recipes that are all so fresh – no wonder your co-workers drool over your lunches! And I totally agree as well on eating what makes you feel good, its so powerful and true – imagine what all our plates would look like if we did just that! Oh I believe it when you say these tacos hit every tastebud on the tongue. 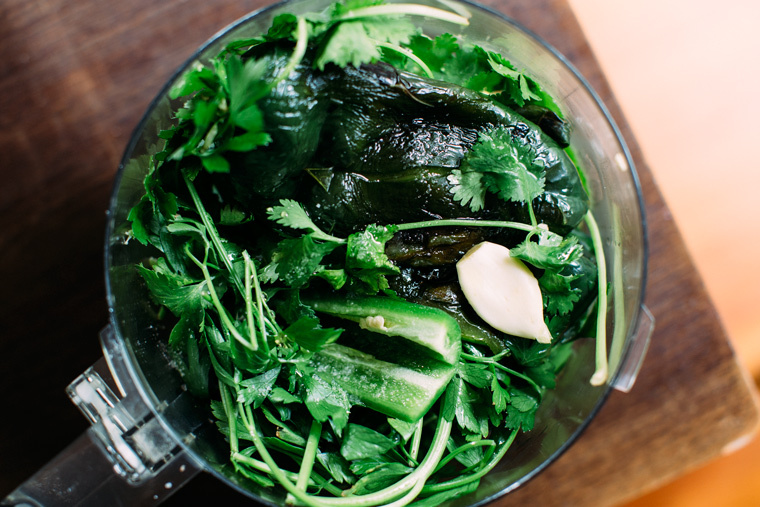 I like the bok choy in them and especially the quick pickles as a topping. There’s something so satisfying about making a quick pickle. Once they’re in my fridge I always find a million uses for them. Love this so much! 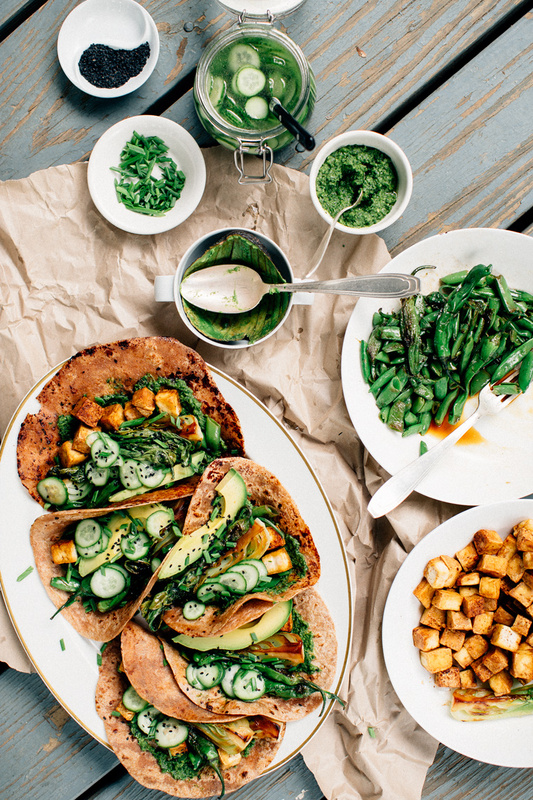 And I love that you started the conversation by talking about how these tacos are about eating delicious food and they just happen to be healthy. Cheers to listening to our bodies! Cheers to fresh produce tasting the best and cheers to you rocking my dinner table with this recipe! Can’t wait to try these (and sort of wish you would just make them for me to bring in for lunch ; ))! Absolutely stunning! I discovered your blog via Pinterest and am so glad I did. Look forward to following and seeing more of your beautiful recipes. YES! I love everything about this and have been thinking about them since I saw these on Pinterest.